L-Star - G & W Machinery Sales, Inc. The Vytek laser LST series is the high performance model with a host of features. The LST models were designed with both cutting and engraving in mind. With engraving speeds of up to 200 IPS (inches per second) and cutting speeds up to 20 IPS the LST is a high performance work horse. With all servo drives and integrated table lift system the ST is the best equipped large format laser system on the market. Laser choices include 75 120,170 and 250 watt RF excited sealed CO2 laser assemblies. 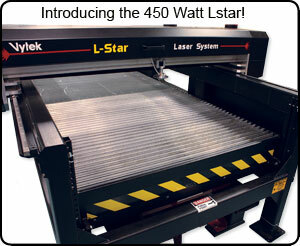 The newest laser in the L-Star series is the L-Star 450 Watt. It has all of the features of the LST series, but with the added capabilities of a 450 watt, water cooled laser. This system is available in 4 standard sizes: LST 4848 (4' x 4') LST4896 (4' x 8') and LST610 (6' x 10'), as well as custom sizes. This system can cut metal up to 3/16" thick steel and up to 25mm acrylic. With its Integrated lift table and live Z axis it's a production solution that will fit nicely into your shop. Not only is it built for production, it's also built for accuracy with its precision ground helical rack and pinion rails and all servo drives, which provide accuracy to .000xxxx per inch. Contact us to learn more about the newest system in the L-Star series of Vytek Lasers. The L-Star range is large enough to handle big jobs but compact enough to fit into even the smallest shops. The L-Star also the one of most flexible laser systems on the market with fantastic cutting and engraving features as well as a host of productivity options and everything in between. The L-Star is really a business in itself. With special sizes & enclosures available upon request. The L- Star hosts an impressive set of standard features from our high performance cutting and engraving head to our standard 2000 lbs table lift system. The L-Star comes ready and equipped to handle a wide range of jobs. Standard features include, High performance servo drives, precision rack and pinion drives in the X axis with an ultra high speed belt drive in the Y axis. The head assembly is standard with air assist and 1.5” (40 mm) of adjustment. The standard interface is Ethernet so super sized files can be processed without having to wait. With an oversize work area the range is ready to process oversize sheet stock or to engrave full size stone slab. The L-Star boasts impressive maximum engraving velocity of up to 200 IPS and an acceleration of over 10Gs. With these impressive performance figures it was necessary to build the L- Star based on an ALL structural steel weldment design. We weld the entire structure as one contiguous unit; stress relieves the structure and precision machine the frame to meet exacting standards. The Vytek L-Star is based on an XY gantry style positioning system. It utilizes dual brushless servo drives in the X axis (long axis) using high precision rack and pinion mechanism on each side. The Y axis uses a single brushless servo motor system driving a high precision belt system. The Y axis positioning system is the result of 2 years of effort to bring the most accurate and fastest system for image engraving on the market the market. In fact we believe the Vytek L-Star is the fastest engraving system in the world. The Vytek frame and table assembly is unique in many ways. Flexibility and throughput being at the top of the list for our customers, we designed the frame assembly around the ability to rapidly change between thick and thin objects as well as heavy ones. The frame concept is designed around a pass through H design which includes a universal table assembly for supporting flat and heavy objects up to 8000 lbs like memorials and glass slab, tile etc. The entire table assembly is positioned up and down by a hydraulic lift unit that repositions the table on our standard system up to 12" and on our extended version 24." The designs moves the item to be cut or engraved up and down leaving the gantry and laser assembly fixed. This way you maintain the highest performance regardless of part height or weight. For cutting applications the table is designed for both Slat support as well as Honeycomb material support. The table is broken into 4 quadrants for down draft exhausting of fumes and includes a built in clean out drawer for debris that falls through the table supports. The H design frame system also allows for a range of other fixture options including Conveyor, removable tray fixtures and special featuring for specific applications. •High Performance Computer/Scanner combination with 17" flat panel display with software pre-installed. • High Performance Computer/Scanner combination with 17" flat panel display with software pre-installed.